* Ocean Vodka is the only vodka in the world made with deep ocean mineral water, organic sugar cane, and powered by the sun. * Ocean Vodka is a family run company based in Maui, Hawaii. * Ocean Vodka is gluten-free with absolutely no GMOs. * Our Hawaii deep ocean mineral water originated as Greenland glacier melt over 2,000 years ago, traveling around the world in deep ocean currents until it reaches Hawaii. * Our water is then sourced from a depth of 3,000 feet off the Kona Coast of the Big Island of Hawaii, where it is ice-cold, deeply pure, and full of naturally occurring minerals. * Once our water is brought to the surface of the Kona Coast, it is organically purified and desalinated through a proprietary, natural filtration process that removes sodium while retaining rich minerals such as potassium, calcium and magnesium. 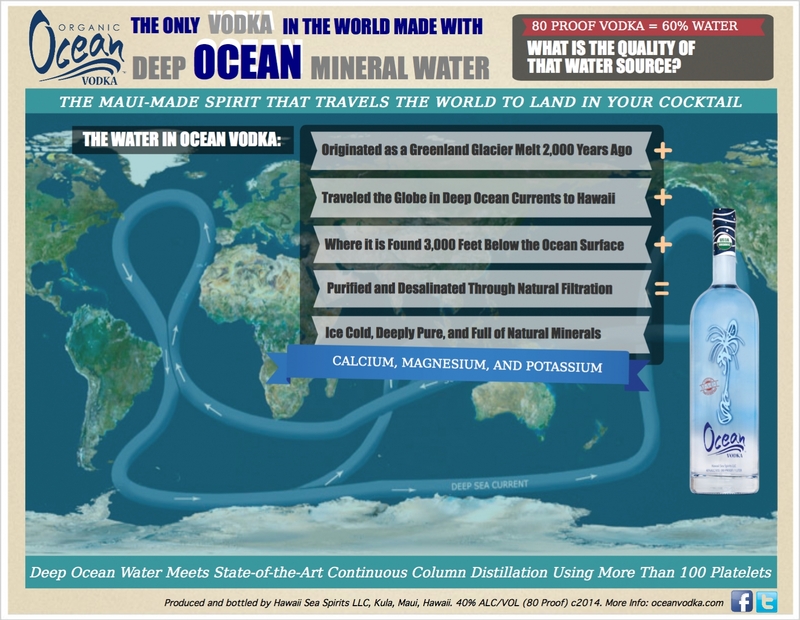 * The high mineral content of our water imparts a unique character to our vodka and adds great depth of flavor to the traditional vodka cocktail.